If you are looking for the best in iron therapy, Fusion Plus™ may be right for you. Fusion Plus™ combines a high dose of different sources of iron with Vitamin C and Probiotic Cultures for maximum toleration, absorption and repletion of your iron levels. In addtion, Fusion Plus™ has a wide spectrum of carefully selected vitamins in order to support a balanced nutrition. If you are looking for the best in iron therapy, don't look any further. Try Fusion today for maximum results. Each Fusion Plus™ capsule is equivalent to about 130 mg of elemental iron. Fusion Plus™ contains 1 mg of folic acid to treat certain types of anemia (not enough red blood cells). Fusion Plus™ patent protected probiotic lactobacillus KE-99 for increased comfort of your digestive system. Odorless, tasteless and easy to swallow: Take one Fusion Plus™ capsule a day between meals or as prescribed by physician. Fusion Plus™ has a wide spectrum of carefully selected vitamins in order to support a balanced nutrition. 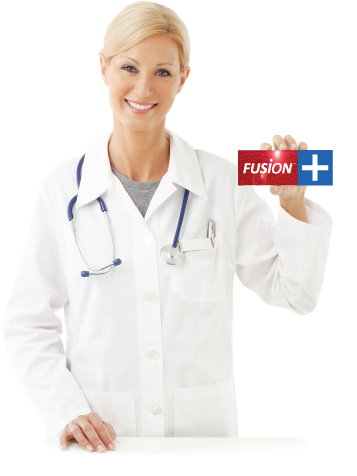 Fusion Plus™ is manufactured with Vcaps® capsule shells that are Kosher certified, Halal certified and Vegetarian Society approved. Fusion Plus™ is 100% gluten free, fat free and sugar free. Like many other multi vitamins, Fusion Plus™ does not contain any calcium for optimal iron absorption.